ONE OF THE BEST KNOWN & MOST PROVEN COLOURED STALLIONS IN THE COUNTRY Imported from Ireland as a foal, his Top Class blood lines go back to both sets of grandparents. He has produced over 80% coloured foals. Country Top Gun has Top Show Horses, Show Jumpers & National Hunt Horses in his pedigree which includes Prefairy & goes back to the legendery Precipitation. His Sire Stensen is the sire of many top class coloured competition & Show horses. His full sister Pauldary's Lady Aaddie is a prolific winner in the show ring... His Grand Sire Ayyabaan was 3rd in the Ascot Gold Cup. His Grand Dam Fidlantia was a grade A show jumper. His Great Grand Sire Prefairy (by Fairy Airy) the great Irish Show Jumping sire & the Champion National Hunt Sire in Ireland. More than 50% of horses in the top 20% at Aachan & Athens go back to the legendary Furioso who was by Percipitation, also the sire of the great Irish Show Jumping sire Prefairy. Precipitation & Furioso ? Precipitation (with his sons Furioso, Prefairy, Supreme Court, Airborne, Sheshoon, Chamossaire) is perhaps the most influential sport horse sire of all. While his influence on jumping horses has long been recognised, some of the most exciting dressage horses in the world today also trace their ancestry to this great sire. Precipitation is the sire of the Irish TB Furioso, the leading show jumping sire in history, who sired an amazing total of 10 horses that competed at the Tokyo Olympics, and the extremely influential warmblood sire, Furioso II. In 1964 his son Lutteur B (1955) won the Olympic Gold medal under Pierre d'Oriola, and in 1966 the same rider won the World Championship with Furioso's daughter Pomone (1959), when she was only seven. Despite Precipitation's success in getting good sire sons, this branch of the Matchem sire line is again in jeopardy. Precipitation?s son Prefairy also has a double relationship to Cor De La Bryere, the sire of Cavalier Royale and one of the regular components of the pedigrees of top jumping sires. This is because Prefairy?s dam was by Foxhunter who was also Cor de la Bryere?s grandsire. While another of Cor de la Bryere?s grandsires was Furioso. He is the stamp of a National Hunt T.B he oozes presence & the pure quality often hard to find in coloured stallions. He will add class & movement to any type of mare. Everybody says his pictures do not do him justice, he is stunning in the flesh. Showing Although we have concentrated on his Show jumping he has the movement, confirmation & presence of a top show horse, which was proven by his many Championships when he did show, including Reserve at the Great Yorkshire. Named in the Horse & hound coloured article as the top coloured show jumping sire in the UK. He has proved he can produce any type pf Sports Horse. We believe he has the largest number of proven offspring competitng in all disciplines at a high level of any coloured stallion & their achievements are greater than by most plain sports horse stallions. Country Top Gun's offspring are successful in all disciplines, his offspring are not confined to one discipline, as the results show he can produce any type of sports horses and Show horses, we believe he has the most all round proven offspring of any coloured stallion. 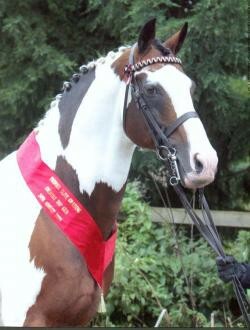 He produces over 80% coloured foals to non coloured mares. His plain foals are superb with the quality, confirmation & performance to give any plain stallions offspring a run for thier money.